In the early 1980s I designed first the Travielo and then the Prakticello. 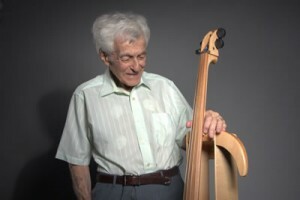 Both involved the same instrument – a light and compact, fairly quiet cello which could be taken aboard an airplane without having to purchase a seat. The only difference was that the Travielo included a carrying case with speaker and amplifier built in, so that the sound was as loud as a normal cello. After manufacturing over 100 of these, I started making only the Prakticello, which comes in a lightweight case without the speaker and amplifier. 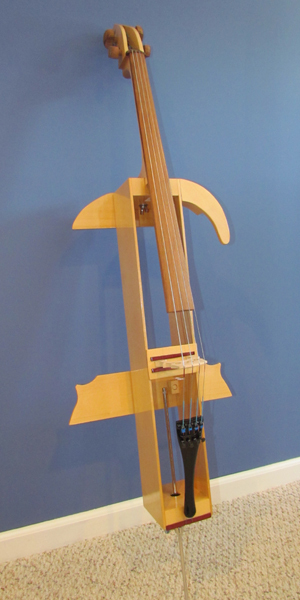 Jerry deGroot took over making these instruments beginning in December 2013. He has made a number of significant improvements without compromising the original design. Some of the improvements include geared pegs, a better way to store the bow and using instrument varnish. Jerry has done an excellent job in making these instruments. Good news, Jerry – the Prakticello arrived early this morning. The Prakticello set up quite easily, and it plays really, really well! Approximately 143 times more responsive than the Yamaha Silent Cello, and amazingly good sound for a box with strings on! We’ve made plans how to transport it on the plane, so we should be practicing on it regularly as soon as we land. The design is absolutely genius. It is simple, sturdy, and very compact. Considering where we store it in the RV, I think I’ll only take the bridge down. It won’t be bouncing around or anything. Thanks so much – it is everything I had expected and better. This will improve my mood immeasurably and I’ll begin to enjoy practicing “on the road” for the first time ever! My Prakticello arrived a couple of hours ago. Great instructions, easy to set up, everything fits well — and it’s much closer to playing a real cello than I had imagined. I like it a whole lot better than the Yamaha Silent Cello I’ve tried. I’m a very happy camper. I just wanted to let you know how pleased I am with the Prakticello … Your instructions were the best … I just love the instrument, not only for its portability but also for the fact that it doesn’t bother others when I play it. The Prakticello is here, all put together, and I just finished practicing! I am impressed with how easy it is to assemble and tune–especially with how well it stays in tune. The fingerboard is very nice to play on. I’m looking forward to working more with it. My Prakticello finally made it here to Oregon, and we’ve spent the morning getting acquainted. I love that I could smell the varnish and wood even before I opened the shipping box. Setup was fairly painless, with tuning taking the longest. I sure appreciate the peg wrench- that’s a nice touch. So far playing it has been a delight. 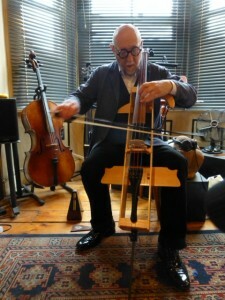 While it’s certainly quieter than my traditional cello, it’s responsive and the action feels very good. The instrument itself is very comfortable to hold- the dimensions are just right. I anticipate this will be a lovely instrument to take with me on my travels, as well as a quieter alternative for when my partner and I play together. He plays the ukulele and my cello often drowns it out! I came back today and I was very curious to unpack and see the PraktiCello. I am extremly happy about the size and the weight of the Instrument! The whole idea is very charming and the way of putting the bow in, is a good solution. My first attempt to put it all together took me about 7 minutes, but it is clear that it could be done quicker and it is not complicated at all. I do like the way it feels while playing and it does have a nice sound. You definitely do not need to spend thousands of dollars buying your cello an airplane seat when your cello is a Prakticello! It would be content with a free seat at the airport lounge and then will cheerfully go into the plane overhead bin. Today I was a bit nervous when I took my travel cello on the airplane for the first time and but to my delight discovered that traveling with travel cello was easy as cake! The Prakticello has arrived! Ik had geen probleem om hem te monteren en te stemmen. Binnen het kwartier kon ik er een Bach cello sonata op spelen. What an ingenious design! It also looks quite sturdy. Ik ben er echt gelukkig mee. Vanaf nu hoef ik geen dag mijn cello meer te missen. Ik wil U danken voor de zorg waarmee je dit maakte en de care waarmee je de verzending opvolgde. Het is duidelijk dat dit veel meer dan een puur commerciele onderneming is,er is ook de liefde van de vakman voor het het instrument that really shines through. Dealing with you gave me a good feeling. Ik hoop dat je nog veel andere cellisten op deze manier kan gelukkig maken. Dit is juist iets waar volgens mij alle cellisten honderden jaren grappen over maken van hoe fijn zou het zijn als zoiets zou kunnen, en nu bestaat het gewoon. Das Practicello ist unfassbar klein und leicht im Reisemodus und somit meines Wissens absolut konkurrenzlos auf seinem Gebiet. Es passt sicher samt kompletter Familie und Gepäck noch ins Auto, hätte sogar in einem Koffer Platz. Trotzdem klingt es erstaunlich gut und wer es gerne laut hat kann ja immer noch Elektronik anschliessen. Gerade im Urlaub ist man aber oft durchaus froh, wenn Nachbarn nichts davon hören. Eine äusserst charmante und tolle Erfindung! The cello is really brilliant! After a couple of days with the Prakticello, I am quite pleased! Thank you so much. I can’t wait for my next trip. I received the Prakticello yesterday and I just thought I should let you know how much I’ve been enjoying it! Its been a pleasure! Thank you very much! The Prakticello arrived safe and sound last night. Thanks very much for your careful packing. I am very happy with the instrument. 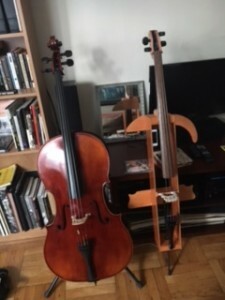 It took no time to set up, and totally agree with the comments I read prior to purchase about it feeling very much like a regular cello to play and having a nice soft tone. I will use the Prakticello not only when travelling but also late at night when I need to keep the levels down. Sinds je me de prakticello stuurde ergens in september, kan ik U met plezier melden dat ik ze al heel vaak meenam naar het buitenland. Tot hier toe was ze in NewYork, Warsaw, Dubai en momenteel in Bangkok. Het is echt mijn cello away from home geworden. Ik oefen op haar met veel plezier en heb tot nu toe nog geen problemen gehad om de douane te passeren. Twee politie agenten in Suvarnhabhumi airport, waar ik al door de douane gepasseerd was konden hun nieuwsgierigheid niet bedwingen en vroegen me wat in de kist zat. Ze waren echt delighted to see the prakticello. The Prakticello was featured in October 2014 The Strad magazine accessories issue. This is a long overdue note to you since we purchased my Prakticello last summer. The cello has traveled a lot, from California to Vermont, back to California, and then driving down to the tip of Baja California Sur, Mexico to the town of La Paz. 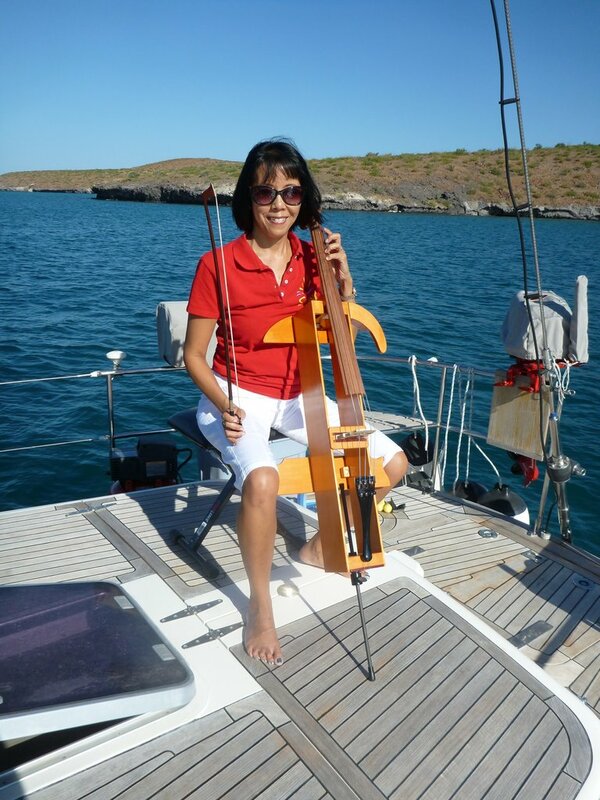 I showed it off to the budding orchestra students a La Paz’s Music School (all in Spanish), and then tucked the cello onto our 48 foot sailboat. She has made her musical debut in anchorages and now on the Pacific Mexico Coast. Being a cellist with an instrument to keep practicing has enabled me to rehearse with various orchestras in Mexico. While I am only an amateur, keeping my music alive has been a wonderful way to connect with the Mexican culture. We have received the Prakticello and are very happy with it. Henry took to it straight away and loves playing it. We haven’t broken a string yet! Using the tuner, which is working a treat. The Prakticello arrived and has surpassed my expectations! So beautiful to look at and a very pleasant sound. Thank you so much!! I received the prakticello on Wednesday. It is truly a work of art. Very, very well done! You’ve built a beautiful instrument. My son and I have both played it, and it’s perfect for what we wanted. The fingerboard action is wonderful, and it fits exactly like a cello! Thank you so very much! Thank you very much for opportunity to practice elsewhere, to take along cello without need to buy the ticket for it! My compliments to Mr. Nussbaum, great invention, fine design! Cello looks simple but charming. I put it together pretty easily and it works great. My only complaint — it’s not very loud! Just kidding. It makes a lovely, quiet sound. This photo is only slightly overdue as my trip to the High Arctic was cancelled in 2014 after the ship broke down. So I took my Prakticello to England where my husband and I walked 100 miles around the tip of Cornwall and I was able to keep practicing every day. This August I flew to Resolute Bay, on Cornwallis Island, in Nunavut, Canada- just a few degrees away from the magnetic North Pole and travelled through the Parry Channel, along the top of Baffin Island and over to Greenland’s west coast. The Prakticello performed beautifully which says a lot in the very dry environment of the Arctic. I’m back in France with the cello, and first of all: it’s FANTASTIC! Bravo! It was easy to assembly, especially with the instructions. The sound is beautiful, and the cello is easy to play. Hopshopandgo.com charged $109.24 for shipping/handling/fuel surcharge to Norway. Thank you very much for the Prakticello! It helps me to practice at nights without disturbing the neighbors and family members Our travel hasn’t happened, we had to cancel it, so I couldn’t try the Prakticello on the road yet. Looking forward to do it in the future! 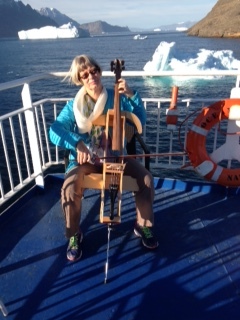 Great cello to take overseas and travel with ease! I received the prakticello yesterday and I am very very very pleased with it, thank you so much ! The assembly was much easier than I though it would be and it really feels like a cello, unlike all the electric cello options I have tried. I am very happy with this cello. It is very handsome, and makes a wonderful sound. It is low volume which is terrific. I love the color. All good. 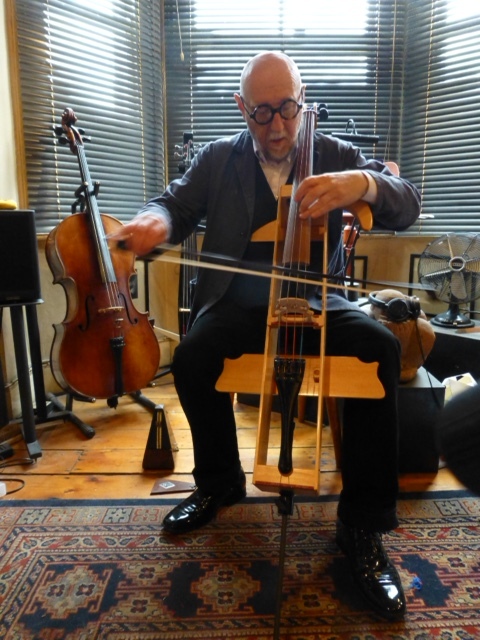 Well, after I spoke with you I discovered just how easy it was to assemble the cello and I’ve now got it tuned and have had a little practice with it. It sounds great, and as I said on the phone, as for its looks: It’s a work of art! I appreciate your fine craftsmanship. And I’m very happy with the choice of varnish. If I’m running into any other questions or problems, I’ll be in touch. Otherwise, assume you have another satisfied customer happily bowing away on his Prakticello! So my prakticello survived six months in Papua New Guinea. I am really happy with the Prakticello. Been flying around with it, no problems with hand luggage issues so far. And it is priceless to have the option of playing/practicing almost regardless of where I go and am. 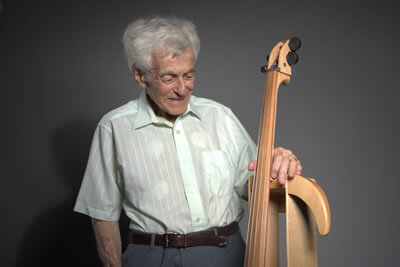 Jerry, I love the cello you built for me. My wife and I play viola and cello and it is wonderful. The cello plays beautifully with a viola. What a joy. Thank you for your craftsmanship. Jerry, it’s wonderful! I put it together just now and played the Brandenburg Concerto #3, so great to run through that in a hotel room!!! It took some time before the strings stabilized, but that happens with new strings on any instrument. Once they were stable the sound was quite nice. I had some fun at the hotel desk when we went to claim our bags and check in. I joked with the clerk that that case contained a musical instrument, could she guess? Everyone guessed “flute” – and when I said Cello she gave me such a look! We laughed and laughed! Thank you for making such a lovely and useful thing, and it was great to get to meet you also. Thanks for taking the time and making the effort to bring it over to Crystal City and save me shipping costs also. I will be bragging about this to all my friends, wouldn’t be too surprised if you hear from some of them. Thank you again. The rather gorgeous Prakticello arrived this afternoon and my father and I had fun assembling it using your instructions. I’ve only had a short play but am already impressed by how resonant it feels and sounds. It’s perfect and beautiful too. I will show my cello friends in England and share pictures on Facebook. It’s going to make the best travelling companion. Thank you so much! My Prakticello arrived safely, and I have it all set up. It looks, feels, and sounds great, and I’m sure it will be very helpful to me on this trip. Thanks for all your hard work! It’s home and works great. It was really easy to set up and I’m surprised at how resonant the C string is! I’m looking forward to playing it a lot in the coming years. Thanks again! Sorry it’s taken me so long to write this. I was thrilled to get my prakticello when I visited my parents a few weeks ago. It was a breeze to travel home with! I showed it to my teacher yesterday and he really likes it too… may become a customer of yours some day, as he’s been thinking about them and was thrilled to see one in person. It’s perfect for practicing at any hour of the day in apartment buildings (which so many of us live in here in Vancouver!). And it sounds so much better than using a practice mute (which makes my cello sound like it has a cold). The Prakticello came today. I have assembled it and played, I think it’s going to be very useful. Love the tuning pegs. John.